New atomsmasher research into cloud formation. CERN’s CLOUD experiment is designed to study the formation of clouds and the idea that Cosmic Rays may have an influence. The take-home message from this research is that we just don’t understand clouds in anything other than hand-waving terms. We also understand the effects of aerosols even less. The other things to come out of it are that trace constituencies in the atmosphere seem to have a big effect on cloud formation, and that Cosmic rays also have an effect, a “significant” one according to CERN.. The hypothesis is simple. 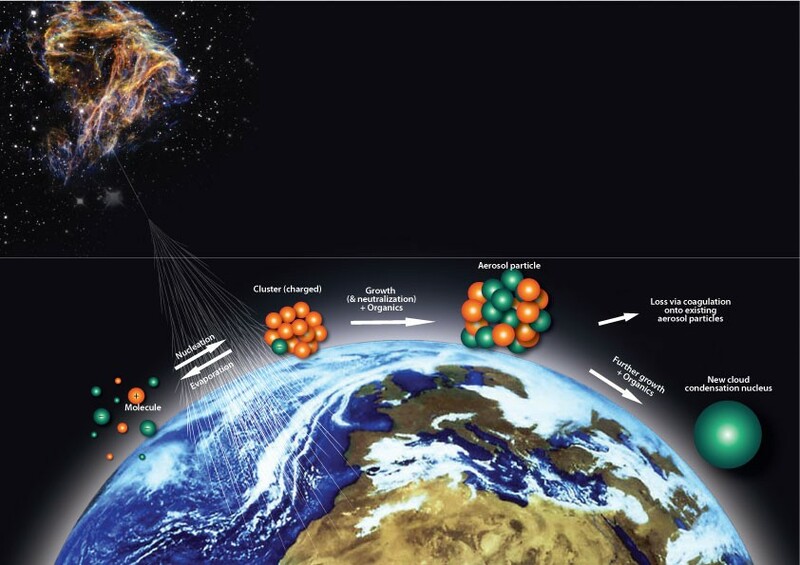 Solar activity modulates the incidence of Cosmic Rays on Earth, and the Cosmic Rays affect cloud formation by providing more condensation nuclei on which water droplets grow. More clouds mean more reflected sunlight and a cooler earth. It’s an elegant idea though in the real world the effect, if it exists, is bound to be muddied by many other influences. One can look for correlations in nature and appeal to climate models to prove or disprove the effect. Model based refutations are not impressive given the assumptions built into them. The observational evidence has been argued about for years. Experiments are however a different thing entirely. Using a chamber to simulate the atmosphere Kirkby et al investigate aerosol nucleation as a function of increasing concentrations of sulphates, ammonia and ionisation. The ionisation source and the stand-in for Cosmic Rays is CERN’s proton synchrotron – the one that feeds its particles into the Large Hadron Collider. Atmospheric air could not be used – it has too many impurities – so the researchers use gas mixtures to recreate it. The chamber, 26 cubic metres of it, its controlled environment and ionisation conditions along with its state-of-the-art instrumentation are clearly the most rigorous test of the Cosmic Ray hypothesis yet devised. However, it must be stressed that the chamber is not the atmosphere.